Children can rest easy after waking their nighttime animal friends to watch over them as they sleep. With Wake Up, Night, there’s no need to ever be afraid of the dark. 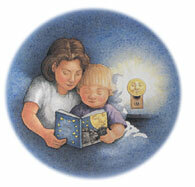 The moon will always shine brightly in your child’s room. Told in charming verse and beautifully illustrated, this enchanting Lift-the-Flap book is perfect for bedtime!